Elena Lobo was an IILJ Scholar from 2010-2013. After receiving her J.D. 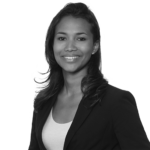 from NYU Law in 2013, she went on to join Cleary Gottlieb Steen & Hamilton as a corporate associate focusing on international corporate restructuring, capital markets and general corporate work in the Latin America Practice Group. She has prior experience working as a Legal Intern in the Civil Division of the U.S. District Attorney’s Office (E.D.N.Y), and as a paralegal at Foley Hoag LLP.